Category: HOMEMADE BUTTERS. Tags: Almond Butter, Homemade, Product of Australia. 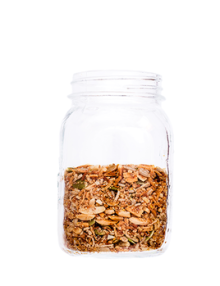 The folks over at The Unexpected Guest believe that breakfast should be gutsy, extraordinarily delicious and good for you and that is why they have crammed this wonderful Granüesli full of raw nuts and seeds and all the freshest local organic ingredients they could find. The only sweeteners used are completely natural like wild Australian honey and super sweet little Australian sultanas.